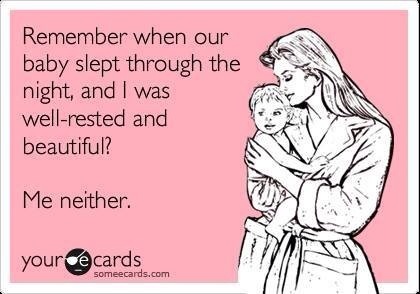 For the past few weeks our house has been a no sleep zone. Baby boy decided that sleep was for wimps and so was waking up to 5 times a night, sometimes for an hour at a time. Mr K and I were struggling. Last Sunday was the last straw. I had finally managed to get baby boy back off to sleep at 3 in the morning after being awake on and off since 10pm and as soon as I got back in bed he woke up! If I hadn’t been so exhausted I would have cried. Instead I left him to cry. I’m not proud of it but I knew that if I had gone in to him again I would have shouted at him. The next day I decided to find a better solution. I knew that baby boy needed to learn to settle himself to sleep without myself or Mr K being in the room so that if he woke at night he could go back to sleep on his own. I looked on google and found what seemed like hundreds of different ‘sleep solutions’. So many of them suggested leaving baby boy to cry and cry until he eventually fell asleep. Now after speaking to my Health Visitor I knew that getting baby boy to settle on his own would involve some crying but just leaving him to scream just seemed cruel. After a lot of research I decided to try a version of the method suggested by Jo Frost (SuperNanny). Basically, baby boy was to be put in his cot, tired but awake, and then I was to leave the room. If he cried I was to leave him for 2 minutes before going in to settle him. If he cried again then he was to be left for 4 minutes before settling him, then 10 and then 15 (if crying continued then stay with 15 from then on). I discussed this with Mr K and we both agreed that we had to try it and be consistent. The first night went well. He settled himself to sleep after the 10 minute check but before the 15 minute check. I was pleased with this as I thought that it would take longer. He woke in the night and again he settled before the 15 minute check. The second night was even better – he didn’t even make it to the 10 minute check and again only woke up once in the night and settled quickly. The rest of the week followed suit. Baby boy settles well at bedtime and a few nights has not even cried once. The longest we have gone in the night is to the first 15 minute check and a couple of times he has even woken up, moaned a bit and then gone back to sleep on his own. I didn’t like the idea of leaving baby boy to cry at all but lack of sleep was killing me and this method has honestly saved my sanity. Baby boy is sleeping much better and despite what the critics may say, we are all a lot happier. Have you used a controlled crying sleep method? Did it work for you? It is definitely getting a bit easier. He is going off to sleep now at bedtime without me in the room. He is still waking in the night but I’m sticking with the system and sometimes he manages to go back off on his own. It’s hard but will hopefully be worth it.